Because Britain has little native manufacturing industry, it has to keep importing, as it would struggle to meet its population’s own needs if imports stopped. (This is quite different from the position of the USA, which still has a large native industrial base that can ‘kick in’ very quickly if necessary.) 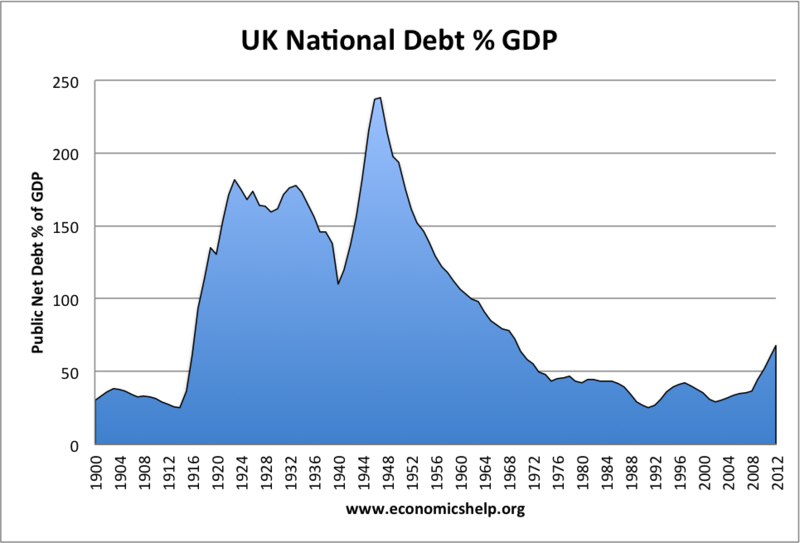 So for the sake of trading relationships, it would be best for the UK if it can get the Debt down quite substantially in real terms – say by going back to manufacturing goods again that creditors would actually want to buy – especially in case circumstances in exporting countries were to change. Say the Chinese economy did collapse, then the British would have to look elsewhere for many of the imports it needs. Not all prospective trading partners will be ‘export-driven’ in the same way as China, in which case the bad real-terms record of the UK as a trading partner would come back to haunt the negotiations – the new prospective exporter might say, “You people never produce anything that I would want to buy, so what use are your credit notes going to be to me? Pay me in dollars or euros, or something!” But one way or another, this has almost nothing to do with the methods the Coalition Government are trying to employ to reduce the Debt anyway. I apologise profusely, not just because of “being accusatory, and further appointing [myself] the referee of the discussion, which is a very childish way to behave” and accept it was a glitch in WordPress software that was responsible for you not getting a notification that I had posted it on my own website. But that’s not the only reason to apologise. I was just getting to the end of writing a new comment, based on the whole of your article this time, which I really thought would be compelling evidence that you had got it wrong, when I discovered a little detail in Warren Mosler’s book which convinced me that you and he were basically correct all along! Well done on winning the argument! Rather than rewriting my comment, which would spoil the flow, I will keep the text as I had originally written it, with me starting off convinced you’d got it wrong. This entry was posted in Benefits, Economy, Poverty, US politics and tagged Bank of England, currencies, deficit, dollar, End of Britain, Federal Reserve, foreign exchange market, Forex, government debt, Government of the United Kingdom, interest rates, MoneyWeek, national debt, pound, Public sector, Warren Mosler. Bookmark the permalink. ← Is MoneyWeek’s “End of Britain” just fearmongering? What about US debt default? Is socialist revolution on the cards?